After we bailed out the “too-big-to-fail” Wall Street banks in 2008 and 2009, things appeared to have improved. Today, Wall Street is rebounding and the job market is looking up. But the folks on Main Street working for low hourly wages or Coloradans paying tens of thousands of dollars in student debt with no end in sight, who lost their homes, or are working part time jobs with no benefits are not so sure. Colorado entrepreneurs seeking green energy solutions and small business start-ups scramble for funding. Needed infrastructure projects like repairing our state bridges are not keeping up with civil engineers’ recommendations. Meanwhile, the marijuana industry has no place to bank its cash. This year, North Dakota celebrates its 96th year of having a state-owned bank, the Bank of North Dakota, and is the only state that has one. Arguably, as a result of its bank, North Dakota was the only state not to suffer budget deficits or declining employment as a result of the 2008 crash. Its unemployment rate was and remains the lowest in the nation at 2.8 percent. And it has had larger budget surpluses each year since 2008, no bank failures, and has remitted $900 million in taxes to the people of North Dakota. Critics attribute North Dakota’s success to its increased oil revenues, but its big increase in oil income did not occur until 2010, and Alaska and Montana have had more oil but still had budget deficits and high unemployment. Today, North Dakota has one of the lowest rates of home foreclosures, and consistently has the lowest rate of credit card default and student loan default in the United States. The Bank of North Dakota makes most of its loans through local community banks, shares the risk, and often guarantees their loans. It invests in North Dakota and its citizens. A public bank here in Colorado working together with our locally owned community banks is a promising option for expanding real prosperity and well-being here. It would be required to lend in Colorado. Its mission would not include paying commissions or bonuses, making risky investments in subprime loans or derivatives, or profiting at the expense of our community. A public bank’s mission would be to serve our communities by helping them thrive and our citizens prosper — through supporting small and medium sized businesses, green energy, lower student debt, reduced home foreclosures, sustainable farming, infrastructure, and more. To this end, the first-ever conference on public banking in Colorado was held in Denver in late January. The conference, Banking on Colorado, featured national authors and local panelists representing Colorado farming, student debt, home foreclosures, green energy, a community bank, and small businesses. For more information on the initiative, go to bankingoncolorado.org. SB 1395 is scheduled to be heard by the Senate Committee on Financial Institutions on Wednesday, February 18, 2015 at 2:00 p.m. in Senate Hearing Room 109. Across the nation, in Pennsylvania and more than two dozen state legislatures and city councils, a well organized effort is underway to create a new tool to insure sound municipal finances and economic development: public banks, to take hundreds of millions of taxpayer funds out of Wall Street banks and put them to work locally with our community banks and credit unions for locally directed economic development and jobs creation. The Wall Street banks and their allies are not anxious for the competition for our deposits, and want to keep them to underwrite their speculation in derivatives and commodities. 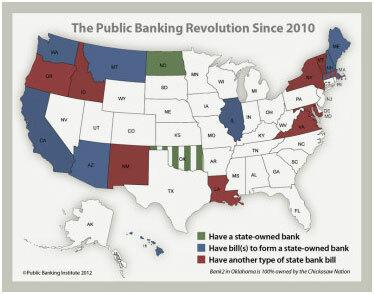 Last November nearly two dozen town meetings in Vermont voted strongly to support the creation of a state public bank. A solid measure of voter intent. Armed with that support and the data to demonstrate conclusively the benefits, public bank advocates pressed the state legislature for a bill to create the bank. But the political and economic elites of the state, led by the state treasurer, closed ranks and turned that effort aside, agreeing only to vote an appropriation of ten percent of the state’s revenue reserve to fund a new economic development initiative, apart from several other existing development agencies. Supporters of this initiative rightly claim that it will make new funds available for investment in the state, this year about another $10 million. But it is a setback for public banking. Vermont public banking advocates have been maneuvered into creating yet another political lending agency, of the kind typical of the old, controlled economy which the voters in the town meetings were hoping to escape. Supporters of public banking in other states and municipalities should take heed of this cautionary tale. The path to a new and more democratic economy does not lead through creation of yet another political lending agency of the status quo and the old economy. The first step on that path is clearly marked: banks owned by the public.